“The Church is the earthly heaven; in these heavenly spaces, God lives and walks about.” In these words of Patriarch Germanus, we get a glimpse of the dizzying heights of the church building’s significance. The Byzantines treated space as God’s dwelling place. Their architectural problem was to create harmony between the natural scale of the human and the transcendent scale of the infinite. Recent attempts to find forms adapted to the modern mentality have often resulted in drowning architecture in the surrounding landscape and in local preoccupations. It has become an anthropocentric religious art. It expresses man and his emotions and the aesthetic search for expressions and forms. Such art has completely forgotten the initial plan of the great workers and builders, the very mystery of the church, and sacred art which is always theocentric in its attempts to express God’s descent into his creation. It is perfectly legitimate to search for new forms, but these forms must express a symbolic content that remains the same throughout the centuries because it has a heavenly origin. Modern builders must listen to and appreciate the suggestions of the chief architect, the Angel of the temple (Rev. 21:15). In thinking about the “heavenly spaces,” I write about something in which I am a neophyte. I have no long-considered opinions or thoughts about architecture. I do, however, know that many of the spaces we are forced to endure in our modern age have something terribly wrong about them. It is also worth noting that I write as a modern American (whose architectural experience often differs from that of many others). There are many things that drive the construction of space in the modern world. Utility (usefulness) is clearly an important question in a world predicated on productivity and similar concerns. The neighborhood in which I live is strung with wires, connecting homes with the cable grid and the rest of our electronic and electric world. For most days, the wires have a way of disappearing – a mind’s trick that wishes to ignore their intrusion into landscape. Last summer I began to hunger for “beautiful space.” Living next door to the Great Smokey Mountains, nature’s beautiful space is never far away – though I was looking for somewhere closer. Actually, I was looking for a place to walk and a place to relax and eat. For the former, I wanted a space whose beauty would give my soul something of the same “peace” I was giving my body in exercise. For the latter, I wanted a simple place where I could eat a non-franchised meal and not be assaulted by various schemes of faux decor. I am not an aesthete, nor am I particularly demanding about food. However, I was taken aback by how difficult my simple request was to fulfill. Our culture is driven by something other than beauty. The same is often true of religious space. Churches today are more commonly constructed with an eye to seating capacity than with an eye to God. The noted exception in America are the number (though still relatively small) of new Orthodox Churches being built. Some of them are truly wonderful spaces. But there is something about the soul of man in the modern world (in many places) that makes beauty difficult to find or construct. If beauty is lacking within the soul itself, it is likely to be unseen even when it is confronted. I am certain that my “hunger” last year was far more than the desire for pleasant leisure. It was my heart telling me to pay attention to the disorder and distortions within myself. Orthodoxy, in its fullest expression, has always urged human beings towards the beautiful. It is a recognition that God Himself is beautiful and the source of every good (kalos) thing. One thing have I desired of the LORD, that will I seek after; that I may dwell in the house of the LORD all the days of my life, to behold the beauty of the LORD, and to inquire in his temple (Psalm 27:4). This entry was posted on January 19, 2010 at 1:48 pm and is filed under Orthodox Christianity. You can follow any responses to this entry through the RSS 2.0 feed. You can leave a response, or trackback from your own site. Wow, Father Stephen, I have often contemplated this but not realizing there were actual references. It was the Cathedral of Christ the Saviour Church in Moscow that opened up my eyes to the intense beauty of the ascetic “Church.” I saw the call and longing of God through the beauty and it touched me profoundly. It bypassed my analytical mind and went straight to the soul. I’ve always loved architect… “The Fountainhead” by Ayn Rand was one of my most favorite books as a teenager. Architecture represents a part of ourselves that is very personal and self-revealing. Beautiful post. Reminds me of Prince Vladimir’s envoys’ response to seeing the Cathedral of Hagia Sophia and saying they didn’t know whether they were in heaven or on earth. My daughter finishes her masters in architecture in May and I love the way her studies are shaping her view of the world and of herself. As you said, we need to “pay attention to the disorder and distortions within ourselves.” As my husband and I work on renovations to our current house, in hopes of selling it and finding something that works better for this stage of our life, I’ve noticed that my soul is happier even in a house I don’t particularly like, because we’re respecting the house now. We’re giving it a soul, and it’s loving us back. Thank you for this. I find that in times of sadness I gravitate towards seeking beauty…usually via my camera. Taking photos of nature is soothing to my soul and allows me to just be still and experience the wonder of it all. I also enjoy finding old buildings and photographing them. The appreciation of beauty was an aspect of Orthodoxy that drew me to it. Have you read When Church Became Theatre by Jeanne Kilde? I’ve only read bits and pieces here and there, but I’ve heard it strongly recommended by those who have read it more thoroughly. 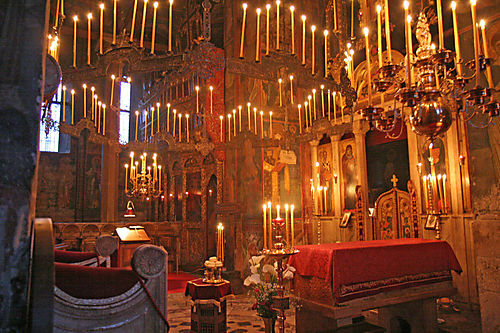 I’ve wondered about the connection between Protestant unbelief in the ever virginity of the Theotokos and their often utilitarian church architecture, as both deny the sacredness of space. Would you see a connection, or is this over-theologizing? father, thank you for this! the beauty of god’s creation is amazing!! i am so fortunate to live in a setting that has a beautiful view. it changes with the seasons but is always breathtaking! i’m saddened that our society seems so busy and occupied with trivia and elecronics that we don’t notice the beauty all around us. I’ll look for the book. I do not think I would draw any direct connection between rejection of the perpetual-virginity of the Theotokos and the failure to understand Holy space. But it would seem likely that if you understood the holiness of Virgin’s womb, it might enable one to also understand the holiness of space elsewhere. “Heaven and earth are full of Thy glory,” should have been sufficient statement of the matter, but is apparently not. I find your observations here so very true of my own experience. As a former evangelical I came out of a modern, seeker-sensitive (market oriented) evangelical church that had recently completed a new building. The architectural planning emphasis was clearly utilitarian and anthropocentric. Attention to aesthetics is not entirely lacking there, but it is definitely anthropocentric in its nature also (like the kind you find in the lobby of a nice hotel). There is not even a permanently-mounted cross in the interior of the auditorium, where services are held (though there is one on the outside of the building.) People will bring their to-go coffee cups and sip away during the Sunday morning services. The Orthodox parish I now attend has many things in common with my former church in terms of the sincere piety of many of its members, the commitment and servant attitude of its clergy/staff, core members and lay leaders, its welcome for visitors, etc., but what a difference to the worship experience an Orthodox understanding and use of worship space and imagery makes! In my experience, the characterization of the Orthodox Church as a spiritual hospital and of many evangelical churches as expressions of the consumer-driven cultural marketplace are aptly drawn. Beauty at the center of our worship, ISTM, is an indispensable manifestation of God’s grace and truly has the power to heal. There’s a little mission church I like to visit occasionally. It has taken a retail store space in a shopping area and turned it into a simple but beautiful space. You walk through the doors from a nondescript parking lot and you are suddenly in the Church; you feel you have entered a holy and beautiful Orthodox space. 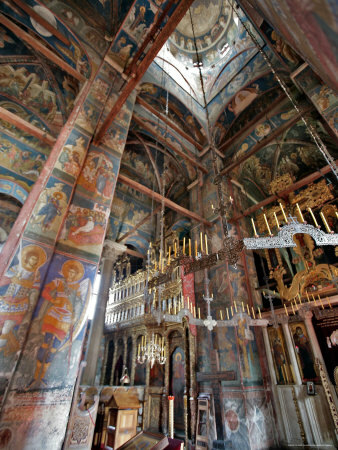 They obviously did their best under the circumstances to transform the simple space they had to work with into an Orthodox place of worship. I was puzzled then by the sermon I heard there once that mentioned that as they grow, they should not think about building a beautiful church but only about planting more mission churches, as though there was no value in creating beautiful spaces in which to worship. As Orthodoxy in America, God willing, continues to grow, let’s hope it is a both/and proposition — yes, we need to establish more mission churches but we also need to build churches that will give a sense of the beauty of the house of the Lord. The combined power of beauty and home draw my heart to heaven. Given what you’ve said, it’s not surprising that people have a tendency to look for beauty. In the past few weeks I’ve been longing to move back to the countryside where I grew up because I’m so tired of the ugliness and dirt of the city. Modern architecture has no soul or substance. What’s with the closed-in office cubicles? And what about the insignificant strip malls that litter the landscape, and yet hardly demand one’s attention except to notice how ordinary they are? But the worst is rooms without windows. I once taught in a classroom that had hideous, movable, water-stained ceiling tiles, ghastly orange carpeting, and NO WINDOWS. I felt trapped in that place.